Haryana Public Service Commission will re-release the HCS (Judicial Branch) Preliminary Application Form 2017 on October 25, 2018 at hpsc.gov.in. 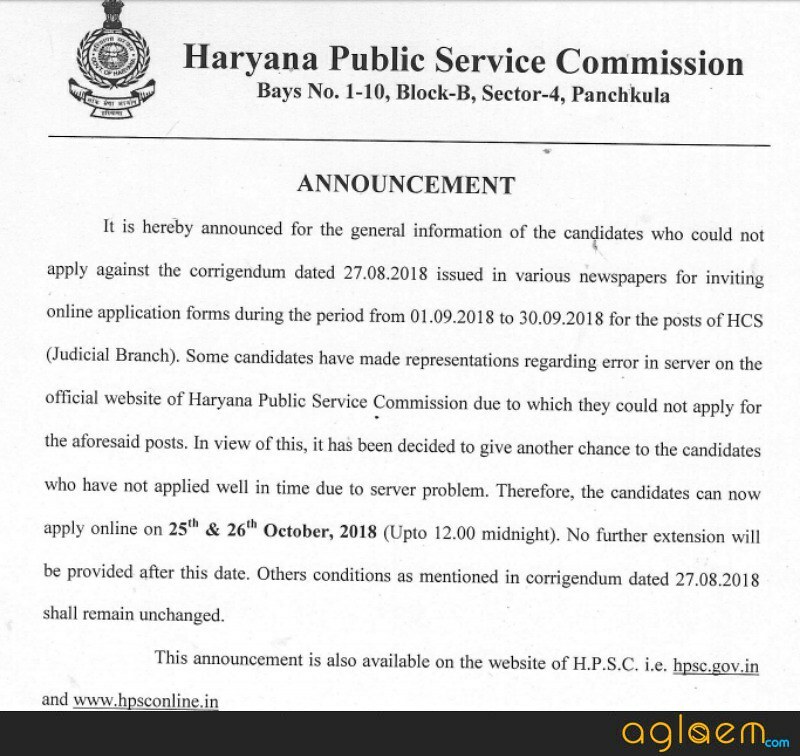 Due to server error at the official website of Haryana Public Service Commission candidates have faced the problem while filling and submitting the application form so the commission has rereleased the Application Form. The last date to fill the application form is October 26, 2018 (Up to 12.00 midnight). Haryana Public Service Commission has issued a recruitment notification for total 107 number of vacancy. 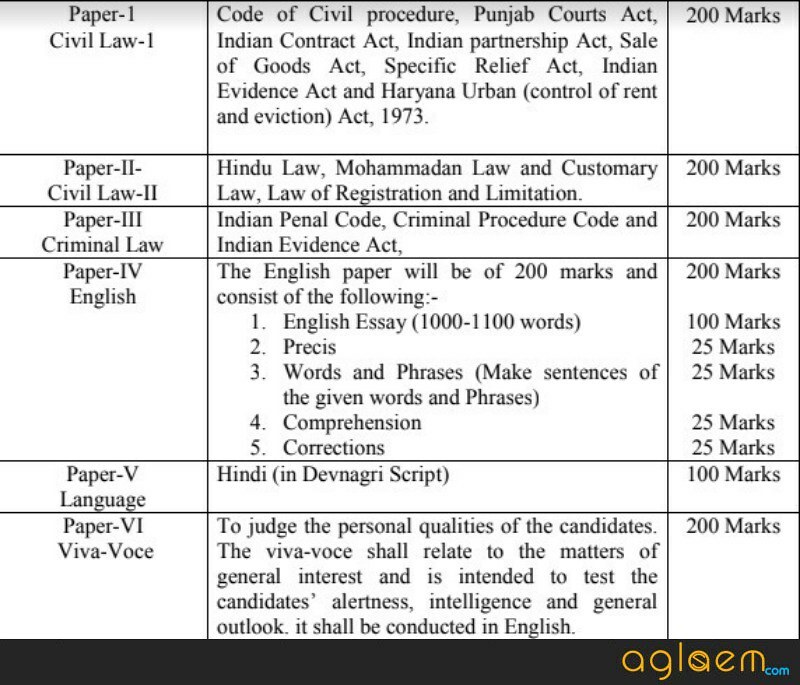 These vacancies are included newly created vacancies of Civil Judge (Junior Division) in the Haryana Civil Judge (Junior Division). Commission has released the application form on August 27, 2018 on hpsc.gov.in. The last date to apply for HCS (Judicial Branch) Examination 2017 is September 30, 2018. Eligible and interested candidates can apply for the HCS (Judicial Branch) Examination 2017. From this page, the candidate will get full information regarding HCS (Judicial Branch) Examination 2017. Latest: HCS (Judicial Branch) Preliminary Application Form 2017 will be re-released by the commission. For knowing more information regarding Application Form click here. The HCS (Judicial Branch) Recruitment will be done on the basis of Pre, Main, and Viva-voce examination. For more information regarding HCS (Judicial Branch) Examination 2017 see the below-mentioned schedule. The recruitment will be done to the post of Civil Judge (Junior Division) for 107 number of vacancy. From below the mentioned image candidates can see the Vacancy Details For HCS (Judicial Branch) Examination 2017. Important Note: Those candidates who have applied earlier against Advertisement No. 6 of 2016 published on March 20. 2018 need not to apply again. The candidates should fill the application form before or till the last date. The candidates should fill the valid details in the application form. 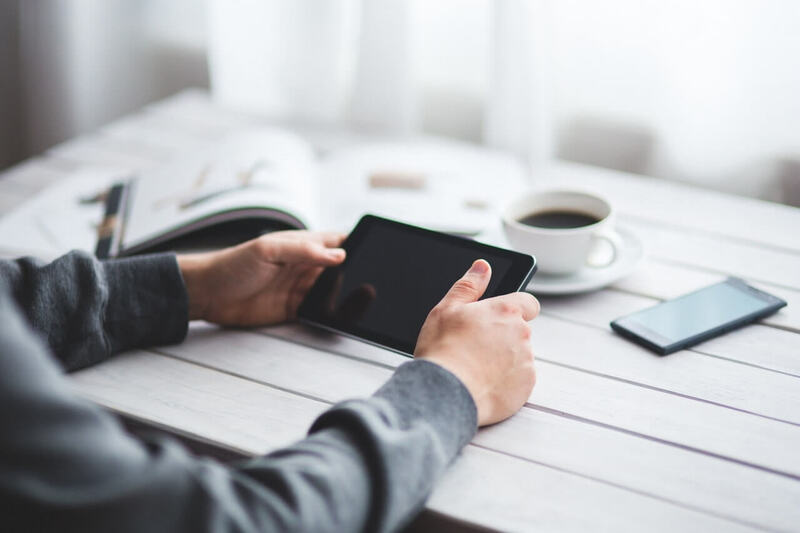 In the application Form candidates need to mention the Personal Details, Contact Details, Educational Details, Upload Photo, and Signature etc. Application Fee: The online application fees which is payable at all branches of State Bank of India or State Bank of Patiala. From below candidates can see the application fee details. Note: The candidates who will qualify the Preliminary Examination will have to apply again by filling the application form for the Main Examination for which they will be informed by giving the notice at the official website. 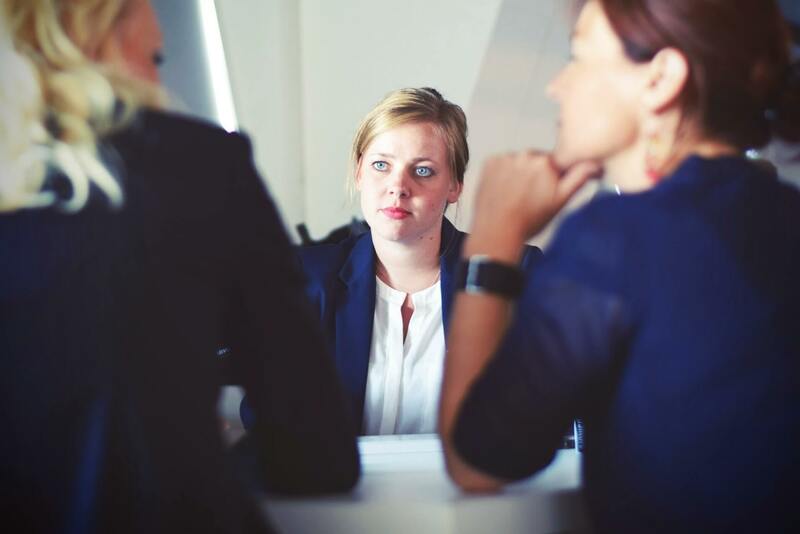 Before filling the application form candidate should read all the eligibility criteria. If the candidate will not full fill all the eligibility criteria that will not be allowed to take part in the further recruitment process. From below candidate can see the Eligibility Criteria For HCS (Judicial Branch) Examination 2017. Age Limit: As on 24 Apr 2017, applying aspirant’s age limit should be restricted to the lower age of 21 years and upper age of 42 years. Educational Qualification: Candidates should hold a degree of Bachelor in 27 Aug 2018Laws from a University established by the law and approved/recognized by the Bar Council of India. Nationality: Candidate must be (a) citizen of India or (b) a citizen of Nepal, or (c) a subject of Bhutan or (d) a Tibetan Refugee who came over to India, before the 1st January, 1962 with the intention of permanently settling in India, or (e) a person of Indian origin who has migrated from Pakistan, Burma, Sri Lanka and East African countries of Kenya, Uganda and the United Republic of Tanzania (formerly-Tanganyika and Zanzibar) Zabia, Malawi, Zaire and Ethiopia with the intention of permanently settling in India. Admit Card is the key to enter in the examination. Separate admit card will be released by the commission for Pre and Main Exam. Admit Card will contain details of the candidate and exam, like- name, date, timing, an address of the exam center, a name of the exam etc. Candidate needs to bring the one valid ID proof (Pan Card, Adhar Card, Voter ID Card, Passport etc) and a hard copy of Admit Card on the day of the examination. Candidates should go through the exam pattern as it will help the candidates to know about the duration of the examination, question types, marks etc. From below candidates can see the Exam Pattern For HCS (Judicial Branch) Examination 2017. The Preliminary Examination shall be of objective type with multiple-choice questions as distinguished from the main written examination which shall be of a subjective/narrative type. The OMR Sheets (Answer Sheets) will be scanned by Computer. So there is no provision of re-checking/re-evaluation of OMR Sheets. It shall consist of 125 questions and each question shall carry 04 marks and for every wrong answer, 0.80 marks shall be deducted. There will, however, be no negative marking in respect of un-attempted questions. The candidates who will qualify the pre-examination will be selected for next round i.e. the main examination. The candidates who will qualify the pre-examination will only be allowed to appear in the main exam. Candidates who will qualify the main examination will be selected for the final round i.e. Viva-voce. The candidates who will qualify the viva-voce round will be finally selected but if the candidates will fail to show document and certificates on the day of the document verification round that candidate will not be selected. The separate result will be released for each examination. At first result for Pre-examination will be declared. Secondly, the result for Main Examination will be declared. After conduction of viva-voce final merit list will be declared by the commission. The result will be based on the performance of the candidates in the examination. The recruited candidates to the post of Civil Judge (Junior Division) will be given pay scale of Rs 27700-770-33090-920-40450-1080-44770/- or it may be revised by the government from time to time. Other benefits will be also included apart from the salary. For more Information regarding HCS (Judicial Branch) Examination 2017 Download the Advertisement.